The global economy has deteriorated significantly since our previous Economic Outlook. Advanced economies are slowing down and the euro area appears to be in a mild recession. Concerns about sovereign debt sustainability in the European monetary union are becoming increasingly widespread. Recent contagion to countries thought to have relatively solid public finances could massively escalate economic disruption if not addressed. Unemployment remains very high in many OECD economies and, ominously, long-term unemployment is becoming increasingly common. Emerging economies are still growing at a healthy pace, but their growth rates are also moderating. In these countries falls in commodity prices and the slower global growth have started to mitigate inflationary pressures. More recently, international trade growth has weakened significantly. Contrary to what was expected earlier this year, the global economy is not out of the woods. 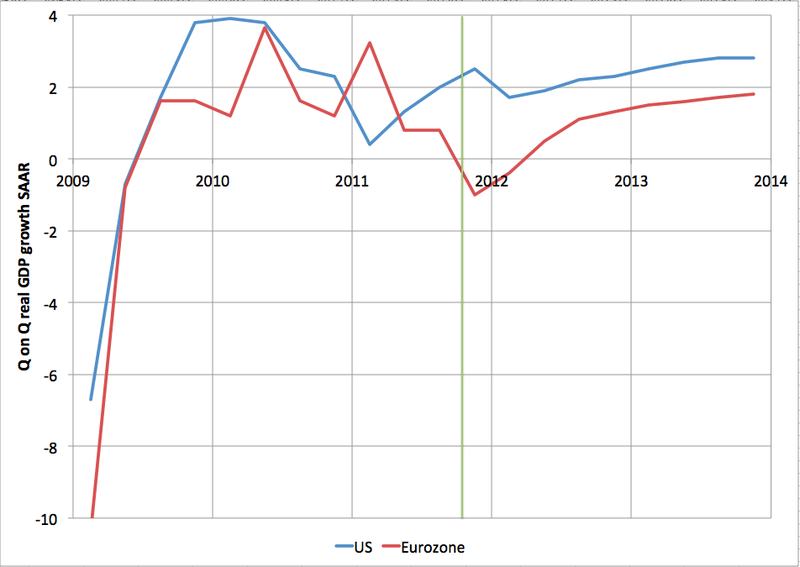 The graph above shows the OECD's projections for economic growth in the US and Europe (to the right of the green line) in the context of data for the last few years (left of green line). 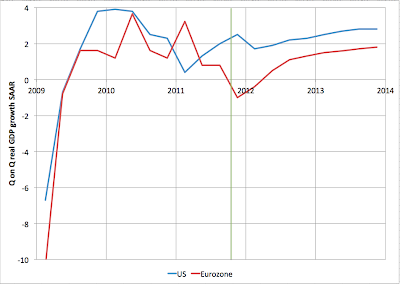 As you can see, the OECD baseline scenario calls for slight contraction in Europe that will be over by Q2 of next year. That it turn will cause a small notch down in US growth but not an actual recession. Personally, I'm significantly more bearish. The best case requires Europe to perform major surgery on its institutions while in the middle of a recession. The worst case is the Eurozone falls apart altogether. I don't see how the best case is consistent with only a mild and brief recession given the level of uncertainty that is bound to arise (indeed has already arisen). It seems to me that a disruption on the level of 2008 is a more likely outcome with multiple important institutions failing and needing to be rescued (the body count is already up to two with Dexia and MF Global). The worst case probably looks more like the 1930s. Still, given that official economic bureaucracies like the OECD are inevitably lagging indicators of recessions, the fact that they are now projecting a recession for Europe is confirming evidence that Europe is already in recession. "Brief Mild Recession:" means that the OECD believes that the ECB turns into the euro-equivalent of the Federal Reserve in the next 48 hours. "Lasting, Severe Depression:" something that is too ghastly to think about, so everyone, clap your hands--louder. I'm on board with your take on this. I am just wondering what financial bets a small time guy like me can make, to hedge against a catastrophe. I buy into the basic notion that we are in fairly serious economic and financial trouble. Yet today's FTSE is up 2.87% and the Dow is up 2.59%. My question is who is buying and why? I would not consider buying a selection of stocks today but obviously there are large numbers of traders doings so. If I, with the solid support of Stuart's postings, am so pessimistic what am I missing? Or how do today's buyers make a living? Each trading day, in of itself, is noise. Markets do not move in a straight line... if they did, they would be entirely predictable, and everyone could short, and make trillions by selling the markets to zero and destroying the system in a matter of days or weeks.... now what fun would that be?